in a bowl, cover and leave for 5 minutes. Then fluff up with a fork and stir in the pistachios, pomegranate seeds, cherry tomatoes and pumpkin seeds. 2. Whisk together the olive oil and harissa, and stir into the couscous. 3. 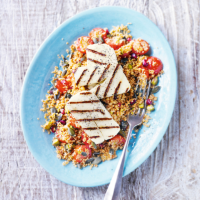 Meanwhile, brush the halloumi with a little oil and griddle or grill for 1-2 minutes each side. Serve on top of the jewelled couscous.